Keaton’s Sherlock, Jr. is a magnificent and meta-textual film that is undoubtedly one of the greatest silent films ever made. Keaton plays a movie theatre attendant/projectionist (he secretly wishes he was a detective) who goes to buy a $1 box of chocolates but changes the 1 to a 4 to impress her. However he is taken over by a “local sheik”, a tough guy who steals her father’s watch and pawns it to buy another box of chocolates. The local sheik plants the receipt in Keaton’s pocket and he is forced to leave her house when her father finds out. Distraught, he returns to his theatre and falls asleep in the projection room, while a film about a stolen pearl necklace plays below in the theatre. 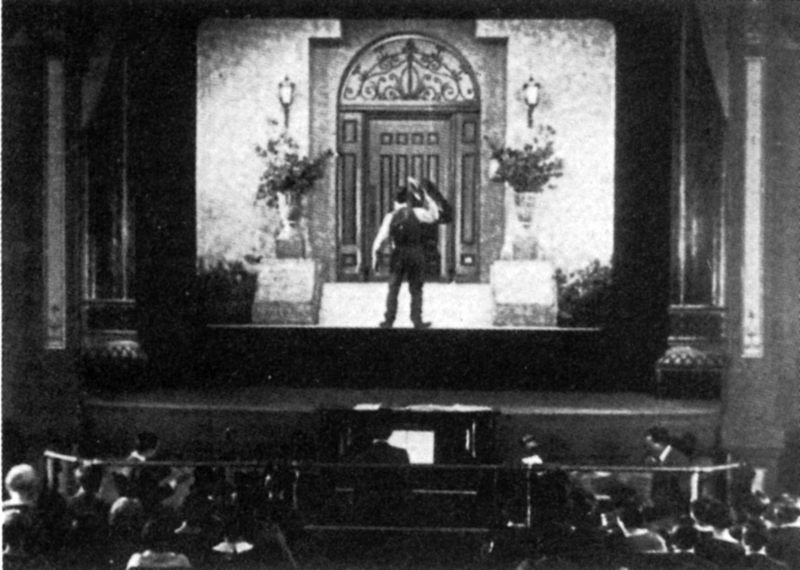 During his dream, Keaton crawls down into the theatre and climbs into the move screen, appearing suddenly in several different films. Finally, he appears as Sherlock, Jr. at a gathering to recover the necklace. He outwits the two who stole the necklace in a great car chase scene. Back in reality, the girl finds out the truth and comes to Keaton’s theatre where he is awakened from his dream and begins watching the film for how to treat the girl. He watches the film playing behind her, which instructs him to gently hold her hands, placing the small ring on it, and kiss her. The next scene shows the actors in the film with a few baby children and Keaton is left looking “stone-faced” and confused. The film was largely a bust when it was released, even after Keaton spent more time putting this film together than many of his others., but today it is largely recognized as a classic. Keaton practiced for four months to learn all the trick pool shots shown at the end of the film, and the filming of the pool scene took five days of shooting. Additionally, Keaton was always known for completing his own stunts, such as in the scene with the water basin where he slipped and badly fractured his neck, nearly to the point of breaking it. This painful take was the one used in the final version of the film. 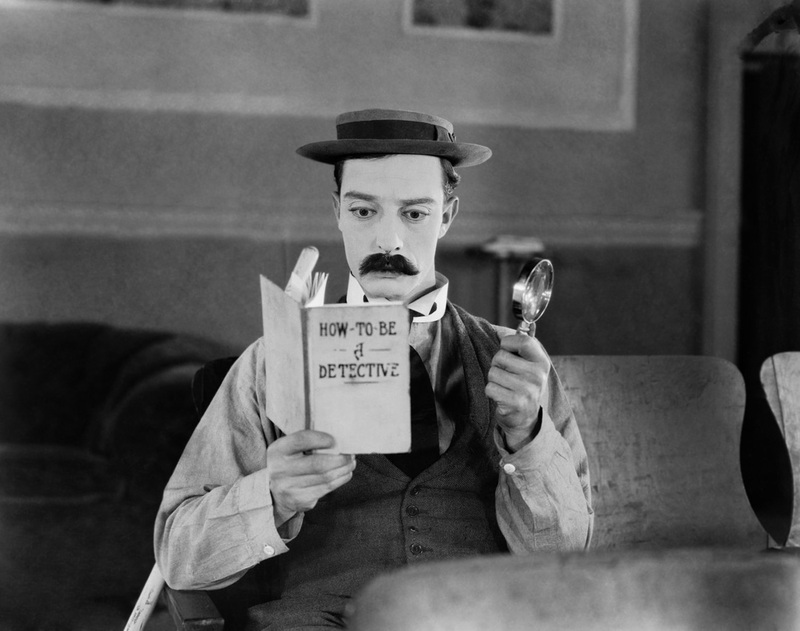 Buster Keaton is the master of cinematic comedy and Sherlock Jr is by far one of his best films. Not only does it bring the audience to uproarious laughter, but also the meta-textual ingenuity laden throughout the film’s concept of a theatre projectionist who dreams of becoming a detective has no analogue. The shot transitions when Keaton’s character jumps onto the screen are marvelous for all audiences regardless of special effects.